A car burst into flames outside a Buffalo Wild Wings near the Hamilton Mall on Friday night. Once the fire was extinguished, authorities made a grim discovery. 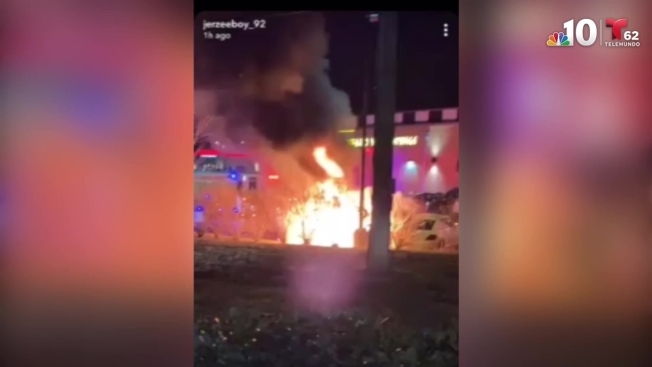 Police found a body in a car after it exploded into flames Friday night in the parking lot of a Buffalo Wild Wings outside the Hamilton Mall in Mays Landing, New Jersey. Hamilton Township police responded to the fire shortly before 6 p.m. Friday and found it completely engulfed in flames. Inside, officers found a man's body. Video of the incident showed bright orange flames raging and thick, dark smoke billowing toward the sky. The man has not yet been identified, and authorities continue to investigate the case. Police say they will not be releasing more details at this time. Anyone with information is asked to call the Township of Hamilton Police Department at 609-625-2700.